• Give the gift of style with the new Build A Bear gift card. and presented in our signature Build A Bear gift box. You will definitely find a fun place to visit! Enjoy making teddy bears, bunnies, cats, dogs, turtles, zoo friends, which include gorrillas, giraffes, leopard, tiger, elephant, pandas, penguins and monkeys. Plus, other stuffed animals. It is very popular place to hold birthday parties for your kids. Each Guest makes their own stuffed animal friend! And now they can continue their friendship adventure at home when they bring it to live online for free and get cool virtual stuff at bearville.com. It is fun for all ages both young and old. Its especially fun for young children to learn the procedure on how to make an animal friend. 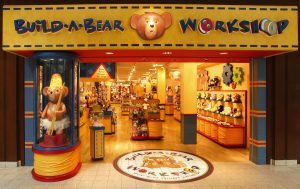 When you visit, you can have your child pick which bear or animal they would like to make. Next, you can bring your animal over to the stuffing machine where they get fluffy and cuddly. Your child can place a heart inside the bear to give it a heartbeat. Then bring your bear over to get a spray bath and remove any particles or leftover stuffing. Next, dress your bear up with many accessories. You can choose from all types of clothing, hats, socks, shoes and accessories.